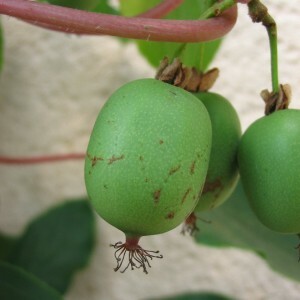 Actinidia is the sort of plants from the family of Actinidiaceae, including some tens types long-term fruit and decorative ligneous and leaf-losing lianas. Various sources estimate the concrete number of types in this sort differently: "about 30", "about 30", "more than 30", "36", "nearly 40", "about 40". More complete list contains 57 original Latin names, and in what, perhaps, should be estimated as exhaustive (site GRIN) — 144 together with options and synonyms. The existence history of the plant on Earth is tracked by scientists from the tertiary period of geological history of our planet which began about 65 million years ago. The edges called now by the Far East Russia then were treated kindly by subtropical climate. Then from the Arctic the freezing went down, and in cold many plants didn't survive. Their considerable part them "went" to East Asia (China, Korea, Japan), in Southeast (from Burma to Philippines and the Indonesian islands), in Central (Himalayas).